Book Marriott redemptions without having points! 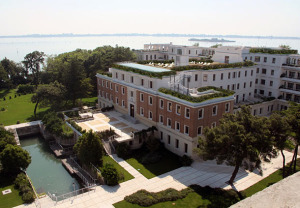 I have just booked a couple of nights at the new JW Marriott in Venice on the back of peer pressure after my kids read ‘Olivia Goes To Venice’! Whilst I ended up using cash, when researching my options I was reminded of a quirk of Marriott Rewards which is unique to the programme and which I have never mentioned on HFP before. Marriott Rewards allows you to book redemptions nights even if you do not have all the points you need. This is a very valuable feature of the programme and one which is probably good business for Marriott. If you see a flight or hotel redemption which you can’t afford, you rarely put in the effort to earn the extra points. Why? Because there is a very good chance that the room or seat will have gone by the time you have the points. By letting you book a room you can’t currently afford, you can start moving your upcoming hotel stays to Marriott Group properties to earn those points safe in the knowledge that your redemption room is in the bag. If you were planning to buy points to make up the difference, it allows you to hold off in case a bonus promotion comes along. It also allows you to lock in a reservation and then start the process of transferring points into your account from a family member. This can often take a day or so and there is a risk that you might lose your room if you wait. The process is very simple. If you try to book a room redemption at marriott.com without having enough points, you will be presented with the following choices – to buy the points or to order the e-certificate after earning the points. Select the latter option. Marriott will deduct your current points balance from your account and tell you how many points you are short. You have until seven days prior to check-in to trigger the reward certificate. This is a very handy feature and one worth keeping in mind if you have Marriott Rewards points. Thanks – never knew about this. As a Marriott Platinum member, I always have mixed feelings of this feature. Often signature hotels get booked on a whim, only for the booking too be cancelled at the last minute. This obviously affects availability. And what happens if you don’t get the points in time? Is the booking cancelled, are you charged to buy the points or do you just pay cash for the room? Although may only appeal to a smaller audience, Air Malta allow you to book an upgrade with miles when you don’t have enough for the full upgrade, but would have enough after the leg is flown. It’s quite good fun to see a negative points balance. Isn’t this very similar to the SPG scheme? They allow you to book a room and give you 7 days to get the points in to your account, too. I’ve done that on a number of occasions – book the room, then buy the points or transfer in some MR points. It’s always worked for me. Starwood will do this for 7 days by phone, apparently. The Marriott scheme is more radical though – you can literally have a room on hold for 11 months. Wish I knew this 2 weeks ago. Just returned from a 2 nights stay, and could have moved some points.